We’ve reached Easter weekend, and sitting in church Thursday night brought back memories of the 1962 Stanley Cup finals. Why? Well, my parents brought me to Church on the Thursday before Easter as an 8 year-old in 1962, and I was none-too-pleased about it. It all worked out, though, for me—and the Leafs. You can read my earlier post on that memorable night by clicking here. Leaftown was abuzz yesterday with the Toronto Sun “revelation” that Tomas Kaberle, the longest serving Maple Leaf, has “had it” with Ron Wilson. The story contained a highly quotable quote from the media favorite, a “friend” of Kaberle (still a friend, we wonder? )—but was printed under the veil of secrecy. Using un-named sources is hardly a first. The ground-breaking Watergate “leak” which led to the fall of President Nixon in the early 1970s (most would argue his own actions led to the downfall, I suppose…) relied on undisclosed sources—nor “naming names” in the media and detective vernacular. Regardless, it’s hardly a shock that Kaberle is all but gone. While any NHL coach begs for a defenseman who can headman the puck like Kaberle, his other deficiencies can drive coaches crazy. Burke has all but eliminated the remaining vestiges of the Ferguson era. No surprise there, either. And Burke’s tone just before the recent deadline while discussing Kaberle (“the player”, he called Kaberle, had basically given the team three options at the last minute, it seems) and his repeated efforts to make it clear he had never asked Kaberle to waive his no-trade clause just felt clumsy all the way around. Management was obviously quite willing (eager? )to move him at the deadline, but had little time to maneuver. In the same breath, they had seemingly worked out a deal about nine months ago with Boston for Kaberle, but that fell through. In short, who wants to be somewhere where they are not wanted? It’s no shock the coach isn’t happy (Kaberle is minus 16 or whatever and Wilson’s comments after the game this past Tuesday were quite clear, though no names were mentioned)—and the player is too smart to admit publicly that he’s not, either. This all gives rise to something that happened during the 1979-’80 season. Those following this site who were also following the Leafs at the time can correct me if my memory is off. 1979-‘80 was the season that the legendary Punch Imlach (pictured at right) returned to Toronto. He dismantled the Jim Gregory Maple Leafs piece by piece. Most Leaf fans of that era know the history—it seemingly started with Imlach refusing to let Sittler and Palmateer take part in the CBC “Showdown” TV show, and a variety of other things built up from there. The very popular Lanny McDonald was traded, and the unrest in the dressing room was evidently rampant. Here’s where I may not remember the facts precisely, but here goes. 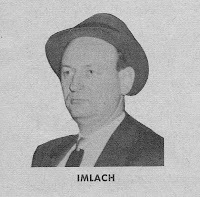 A Globe & Mail reporter wrote a story with a number of anti-Imlach quotes in the newspaper (no internet in those days, of course). The tasty—and nasty part—was that not one player was named. They were all basically “unidentified” players or sources who were quoted. Now while one can argue the issue from an ethical perspective, it’s not like that style of reporting was totally off base, even at the time. Otherwise, many important stories, including Watergate, would never have hit the newspapers back then—and since. However, a long-time columnist, the highly-respected writer Scott Young (one of the finest of his generation, in my view, as a hockey writer and later current affairs columnist at the Globe) quit the newspaper in protest because of the way that Globe ran the anti-Imlach story: with no attribution. By that time, Young (the father of Neil Young, one of Canada’s more recognizable musical artists) had been back on the sports beat. He had also authored a book with Imlach, and would later do a sequel to Punch’s 1970 “Hockey is a Battle” after Imlach was finished with the Leafs for a second time in the early ‘80s. But his stand was based on journalistic principle and he left the Globe, never to return. I doubt anyone is handing in their resignation at the Toronto Sun today.